Defeated Democratic presidential candidate Zionist Hillary Clinton made a rare public appearance on Thursday evening — to come out and push for the US to bomb Syria. The former secretary of state called for more US international intervention while speaking at the Women of the World Summit in New York, saying that the US should target Syrian airfields. “That air force is the cause of most of the civilian deaths, as we have seen over the years and as we saw again in the last few days,” Clinton said. “I really believe that we should have — and still should — take out his airfields and prevent him from being able to use them to bomb innocent people and drop sarin gas on them,” she added, referring to Syrian President Bashar al-Assad, and aligning herself with the likes of Iraq War architect Bill Kristol and neoconservatives such as Republican Senator John McCain. The chemical attack has raised many eyebrows, however, as it came just days after the Trump administration stated that Syrians should decide who is running their country. “It makes no sense, even if you were totally separate from this and take no sides of this and you were just an analyst, it doesn’t make sense for Assad under these conditions to all of the sudden use poison gasses. I think it’s zero chance that he would have done this deliberately,” former Texas congressman Ron Paul said on Wednesday. Kentucky Representative Thomas Massie has also been outspoken about how the attack would not serve Assad’s interests. Many of Trump’s most prominent supporters on social media have also been urging the president to ignore calls for intervention. The push for “action” following the alleged chemical attack in Idlib, Syria is reaching fever pitch. Indeed, it may already have had disastrous consequences. The spokespeople for power that are the Western press consider the case against the Assad regime air-tight. Absent any forensic, or even circumstantial, evidence the mainstream media have resorted to simple arguments from authority looks of bewilderment. The trouble is “authority” doesn’t seem have any cohesion in this matter – so the press have carefully chosen who they will listen to… and who they will remove from their websites. Col. Hamish de Bretton-Gordon is the favored voice of “reason” on these matters, he has dismissed any idea other than a deliberate attack by the Syrian government as “fanciful”. And has been cited everywhere from Channel 4, to the Daily Mail to the Guardian, to the BBC. He is universally credited as a “chemical weapons expert” who works as the director of “Medics Under Fire”…. but that’s not his only job, just his most recent. Previously Commanding Officer of the UK CBRN Regiment and NATO’s Rapid Reaction CBRN Battalion, Hamish is one of the most operationally experienced CBRN practitioners in the World and is regarded as one of the leading experts in Chemical and Biological Counter Terrorism and warfare. He has also worked with US networks and British newspapers to smuggle chemical samples out of Syria for verification in UK and France. … so he’s hardly an objective source. Of course, “Medics Under Fire” is nothing like what it appears to be, either. Its name conjures up imagery of global charities, along the lines of Medecins sans Frontieres. It is nothing like that, in truth it is a Western-backed NGO working out of Syria, very much like the White Helmets. In fact, their websites are almost completely identical. Russia’s claim that the latest poisoning is a result of a conventional attack on an opposition arms storage facility should not be dismissed out of hand. While it is true that nerve agent can be destroyed by explosion, it is perfectly possible that some agent could survive and be ejected out as a result of an explosion. … but obviously nobody there was listening, because “dismissing it out of hand” is exactly what they have done. Mr Smith was also interviewed on Channel 4 news (curiously absent from their online archive), and ABC news in Australia, both times saying very similar things. … the official who led the UN-backed operation to remove Syria’s chemical weapons told the UK’s Channel 4 News that the Russian version of events could not be discounted. “If it is Sarin that was stored there and conventional munitions were used, there is every possibility that some of those [chemical] munitions were not consumed and that the Sarin liquid was ejected and could well have affected the population,” Jerry Smith said. This paragraph was completely removed just 35 minutes later. The current version of this article makes no mention of Mr Smith at all. No reason is given, and there is no note referencing that the article had been amended. A reminder that these are standards deemed acceptable by the “news service” for which we are all forced, by law, to pay. Our thanks to the media lens twitter for bringing this issue to our attention, and to newssniffer for the very important work they do. What’s really behind America’s rush to war in Syria? Without any recourse to international law or the United Nations, the Trump administration has embarked on an act of international aggression against yet another sovereign state in the Middle East, confirming that neocons have reasserted their dominance over US foreign policy in Washington. It is an act of aggression that ends any prospect of détente between Washington and Moscow in the foreseeable future, considerably increasing tensions between Russia and the US not only in the Middle East but also in Eastern Europe, where NATO troops have been conducting military exercises for some time in striking distance of Russian territory. In the wake of the horrific images that emerged from Idlib after the alleged sarin gas attack, the clamor for regime change in Damascus has reached a crescendo in the West, with politicians and media outlets rushing to judgement in ascribing responsibility for the attack to the Syrian government. No one knows with any certainty what happened in Idlib, which is why an independent investigation should have been agreed and undertaken in pursuit of the truth and, with it, justice. However only the most naïve among us could believe that this US airstrike against Syria was unleashed with justice in mind. How could it be when US bombs have been killing civilians, including children, in Mosul recently? And how could it be given the ineffable suffering of Yemeni children as a result of Saudi Arabia’s brutal military campaign there? No, this US attack, reportedly involving 59 Tomahawk missiles being launched from ships in the eastern Mediterranean, was carried out with regime change in mind, setting a precedent that can only have serious ramifications for the entire region. Regarding the attack in Idlib, what we can say with certainty is that a time when pro-government forces in Syria were in the ascendancy on the ground, and when the Syrian government was making significant progress on the diplomatic front, it would have constituted an act of ineffable self-harm to launch a chemical weapons attack of any kind, much less one of this magnitude. In fact it would have conformed to the actions of a government that was intent on bringing about its own demise. What also must be taken into consideration is the fact that the Organisation for the Prohibition of Chemical Weapons (OPCW), an organization supported by the US, confirmed back in June 2014 that the process to destroy Syria’s entire stock of chemical weapons had been completed. Moreover, the horrific images and eyewitness testimony that have emanated from Idlib in the wake of the attack have come from pro-opposition sources. No Western journalist or news crew would dare set foot in Idlib, or indeed any other part of opposition-held territory in Syria, knowing that as soon as they did they would be abducted and slaughtered. Trump has proved with this unilateral military intervention that he can easily be dragged into conflict. Just a few days after his administration confirmed that regime change in Syria was off the table, that its focus was on defeating terrorism, he unleashes an airstrike that will only have emboldened the very forces of terrorism whose defeat he had stressed was the focus of his foreign policy previously. So what now? Clearly, this military action places Russia in a very difficult position. Since joining the conflict in Syria at the end of September 2015, at the behest of the country’s government, Moscow had been working tirelessly to bring about a negotiated settlement, one involving opposition forces and parties deemed moderate relative to the Salafi-jihadi fanatics of ISIS and Nusra, etc. It is a diplomatic process that has just been dealt a shattering blow, with the opposition now undoubtedly convinced that regime change is in the offing via Washington and therefore encouraged to work towards this end. Meanwhile, as for Washington’s regional allies – Israel, Saudi Arabia, Qatar, and Turkey (with Erdogan guaranteed to hitch his wagon to whoever appears to be in the driving seat) – they will most likely begin calling for more military action against Damascus now, viewing the US airstrike as the catalyst for open season on the country’s sovereignty. As for Trump himself, having been under inordinate pressure since assuming office in January from the Washington media, political, and intelligence establishment, this action will earn him some much needed approval and, with it, respite. The signs with regard to his administration had been ominous for some time, starting with the forced resignation of Mike Flynn as his National Security Adviser in February, and continuing recent departure of Steve Bannon from the President’s National Security Council. It comes as further evidence that neocons have reasserted their dominance over the White House after a short and intense power struggle. On a wider note, the lack of short-term memory in Washington is staggering to behold. Fourteen years after the disastrous US invasion of Iraq, which only succeeded in opening the gates of hell out of which ISIS and other Salfi-jihadi groups emerged, and six years after turning Libya into a failed state, in the process sparking a refugees crisis of biblical proportions, here we have yet another act of aggression against a sovereign state in the Middle East by the US. Destroying countries in order to save them is the story of every empire there has been. But as history reveals, every empire carries within itself the seeds of its own destruction. Donald Trump is now on course to end up going down in history as a leader who rather than save the US from itself, may only have helped speed it down the path to its ultimate demise. 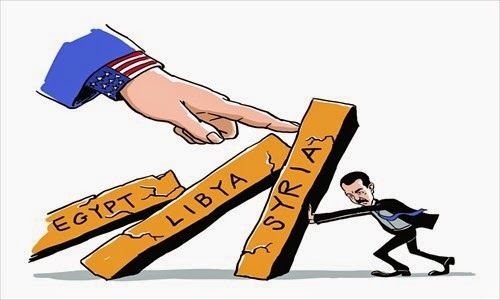 Posted in USA, SyriaComments Off on What’s really behind America’s rush to war in Syria? Exclusive interview with British Journalist Tom Duggan in Damascus at the French Hospital tells us about the chemical attacks accusations. How quickly enemies can become friends. All you have to do is bomb people. Last night, and much to chagrin of people who thought Trump would not escalate matters in Syria, the US military launched 59 Tomahawk missiles into Syria, allegedly attempting to destroy a government airbase. They warned the Russian government before-hand, who will have passed on that warning to the Syrians, meaning the area was probably on alert, with any important equipment or personnel removed. The Pentagon have also stated that, at this time, there are no plans for any other strikes or any campaign in Syria. Q2: Supposing the attack definitely happened as most are reporting – and that is a dangerous assumption to make these days – what have the results been? At last count the number of Syrian casualties stood at 6 dead servicemen, and 9 dead civilians (including four children) and several more wounded, together with the loss of six aircraft. The airbase they attacked looks far from destroyed in footage from Russia 24 (see here). And chemical weapons? Well, they didn’t destroy any…and say they weren’t trying to do so (see our brief story on that contradiction here). So in terms of military targets, this strike has achieved very little. The attack was pitifully inefficient, of the 50-70 missiles launched, only 23 struck anywhere near their targets. The other 30+ are currently unaccounted for. Tomahawk missiles cost between $500,000 and $1,500,000 dollar each, which means the US just spent between 25 and 105 MILLION dollars on dinging up a couple of aircraft hangars and murdering less than 20 people. Q3: …then why do it? There must be some political wins in this situation to justify the price tag, because the damage done to the “enemy” is practically zero. Indeed, when you take into account that the Pentagon informed the Russians, who will have informed the Syrians, and the reports of Syria evacuating personnel before the attack… the entire event appears somewhat theatrical. Meaning it was an entirely political act, possibly intended more for a domestic audience than anything else. It had no bearing on the civil war at all, the airstrikes on rebel positions weren’t even halted for a day. Whether it was the product of an impotent emotional tantrum, or a cynical public relations gambit, there is no question the attack was completely illegal under international law. But the American press have never cared much about that. Given that America’s reputation was already in tatters, among those who consider such trifles important, this won’t do much damage. They will take a hit on that front, it probably won’t matter in the long-run. The list of unpunished American international crimes is hugely long. This small addition barely qualifies. Always the most important question. Trump can definitely get some short-term political gains domestically here. Having “defied” the Russians and “stood-up to” Assad, Trump can now enjoy a period of respite from the “Trump is in Russia’s pocket” talk. Plus, the wider establishment – so fond of calling for “action on Syria” – will be forced to either agree with (and consequently legitimize) the administration, or criticise an attack on Syria and dial back their own calls for war. What Trump gains in terms of favour within the deep-state and political establishment he will lose in terms of approval with his voting base. One of the biggest issues contributing to Trumps electoral victory was his non-interventionist stance on the ME. This may only be a superficial event, but the list of people approving of and/or celebrating it is enough to alienate a lot of Trump voters for good. But he doesn’t have to worry about that for the next four years. One definite winner in all of this is Turkey, so long illegally picking at land along the Syrian border. They now have a precedent for a NATO ally taking unilateral action against the Syrian government on very flimsy evidence. They will take that and run with it. Israel, similarly, will see this as permission to be even more active in Syria. Both are key suppliers to the rebels, both are carving out chunks of Syria for themselves. A danger does still lurk, of course. Whether Trump took this action to make a point, or was talked into it by generals and the like, the first official American attack on Syria has now taken place. Mission creep, intended from the outset or no, is an important thing to keep an eye on at this point. My days of hoping for the best from Donald Trump – and at least appreciating the fact that he was not the neocon/liberal hawk that Hillary Clinton is – are over along with my hopes that he might implement his campaign promise and take U.S. foreign policy in a more positive, less warlike, direction. From being possibly part of the solution, President Trump has become an integral part of the problem. And with his bigger-than-life ego, petulance and stubbornness, Commander-in-Chief Trump is potentially a greater threat to world peace than his weak-willed predecessor Barack Obama. This week, Trump ignored Russian calls for an investigation into Tuesday’s alleged chemical gas attack in Idlib province before issuing hasty conclusions on culpability. 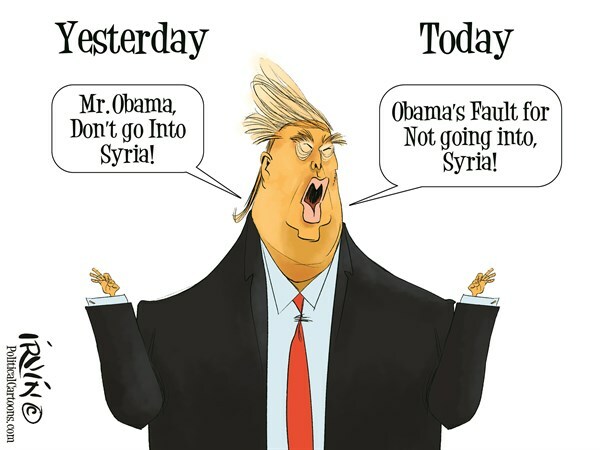 Instead he accepted a narrative of Syrian President Bashar al-Assad’s guilt despite indications that the incident may have been either an accident (the release of poison gas at a damaged rebel warehouse) or a false-flag operation designed by Al Qaeda-affiliated rebels in Syria. The Assad-did-it storyline was disseminated by the White Helmets and other phony NGOs that are financed by Washington and London, and that narrative was accepted by the White House. Without waiting for any comprehensive review, Trump ordered the firing of 50 or more Tomahawk missiles against a Syrian military air base in Homs province, thereby crossing all Russian “red lines” in Syria. Until this point, the Kremlin had chosen not to react to signs coming from Washington that Trump’s determination to change course on Russia and U.S. global hegemony was failing. The wait-and-see posture antedated Trump’s accession to power when Russian President Vladimir Putin overruled the dictates of protocol and did not respond to Obama’s final salvo, the seizure of Russian diplomatic property in the U.S. and the eviction of Russian diplomats. The Russians also looked the other way when the new administration continued the same neocon rhetoric from the tribune of the United Nations Security Council and during trips to Europe by Vice President Mike Pence, Defense Secretary James Mattis and Secretary of State Tillerson. But the missile attack in Syria is a game-changer. The pressure on Putin to respond in some serious way will be immense. Putin has a cool mind and we may anticipate that the Russian response will come at a time of his choosing and in a manner that is appropriate to the seriousness of the U.S. offense. Look for a response by the end of the month. In the meantime, we who have been hoping for a change of direction — for the rooting out of the neocons and liberal hawks at the heart of the Deep State — should recognize the dangers and the challenges ahead. One way or another, the White House must be told that arranging foreign policy moves out of purely domestic calculations, such as likely happened on Thursday, puts the nation’s very existence at risk. Acting tough by striking out at Russia and its allies is not the way to form a coalition to pass a Republican tax bill or revive the repeal plans on Obamacare or divert attention from the Democrats’ obsessive investigations into Russia-gate. The same may be said of an alternative reading of the missile attack: that it was intended as a message to visiting Chinese President Xi that should there be no joint action to restrain North Korea, the United States will act alone and with total disregard for international law. Either logic in the end is a formula for global suicide. It would be completely nonsensical and insane for Syria to use chemical weapons while the war is turning in its favor. And, of course, there is evidence that refutes the allegation. For the record, when a Zionist and war criminal Barack Obama was bent on attacking Syria in 2013 following false accusations that the Assad government used sarin gas in Ghouta, Syria – to preempt the threatened invasion Assad agreed (UN Resolution 2118) to give up Syria’s stockpile of chemical weapons (a deterrence against Israel’s nuclear weapons). Now the Syrian government stands accused of using a chemical that was disposed of under international supervision. Is the Syrian government that stupid to risk another threat of invasion by using a non-conventional attack? And why is this new gas attack in Idlib taking place just after Rex Tillerson declared that it is the Syrian people who should decide the fate of their current president? Moreover, to criticize “the Assad regime” seems starkly at odds with a fundamental tenet of Chomsky’s philosophy: that his concern is primarily the terror and violence carried out by his own state, the USA. That is Chomsky’s assessment, but it is factually inaccurate. Iran and Hezbollah are helping fight the terrorists in Syria. Also Chomsky does not discuss an important point: that Russia was invited to aid the Syrian government, as were Iran and Hezbollah. The US is uninvited and Syrian president Assad calls US forces in Syria “invaders.” Chomsky is well versed as to what happens when uninvited US forces show up in foreign lands – among them Korea, Viet Nam, Panama, Grenada, Somalia, Haiti, Afghanistan, Iraq, Libya, Yemen, etc: genocide, millions killed, millions displaced, economic infrastructure destroyed, and vassalage. It is imperative is that people become informed. We should all listen to the words of intellectuals and persons who have demonstrated great integrity, but we must also pay heed to our internal dissonance to seemingly incongruous information; we must question and apply rigorous challenge to that information; and based on our assessment of the factual accuracy, logic, and morality of the information we must reach our own conclusions. Avoid the allure of unquestioningly accepting the words of authority! Regardless of personage, open-minded skepticism is the key to developing our own ability to cut through disinformation and thwart the insidious acts propaganda is intended to disguise. Critical and moral thinking is crucial to the revolution for a free and socially just world. 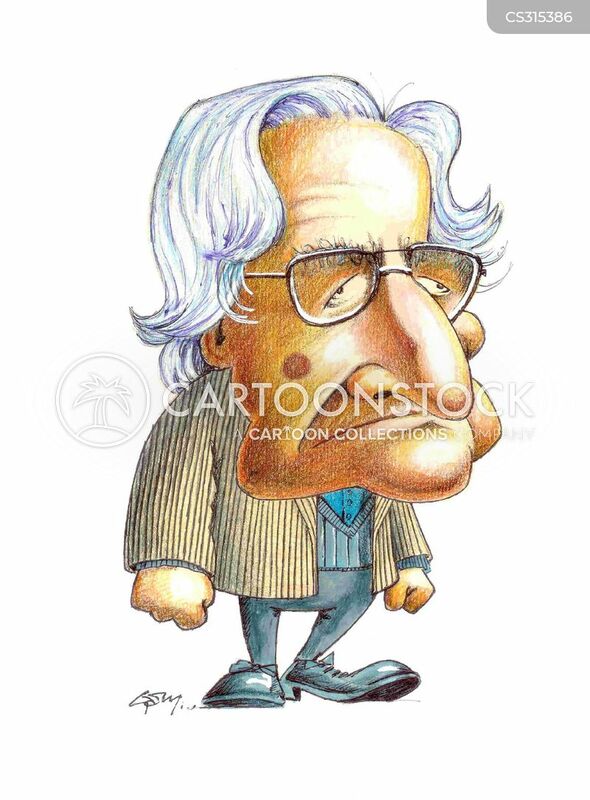 Posted in SyriaComments Off on Is Noam Chomsky Manufacturing Consent for Regime Change in Syria? On Tuesday 4 April there were reports of children and other civilians killed by chemical poisoning in the town of Khan Sheikhoun, Syria. There were contradictory reports, some saying they smelled the gas; others claiming it caused immediate death like odorless sarin. – Many of the video scenes depict an area set into a limestone quarry with apparent caves and storage depots. There are flat bed trucks with bodies scattered on the ground in this semi-industrial area. Other videos show scenes in medical clinic. From the start, the Syrian conflict has included an information war. Hillary Clinton boasted of “training for more than a thousand activists, students and independent journalists.” In December 2012, NBC journalist Richard Engel was reportedly kidnapped and abused by “shabiha” supporters of the Syrian government. Engel and his film crew were “liberated” by Free Syrian Army rebels after a gunfight with the Assad supporting kidnappers. In reality, the entire episode from kidnapping to rescue was a hoax designed to demonize Assad supporters and glorify the “rebels”. The true story emerged years later after the actual events were leaked. When it was going to be made public, Engel finally admitted the truth. In February 2014, it was announced that a defecting Syrian military photographer, who was anonymous but code named “Caesar”, had 55 thousand photos showing the torture and murder of 11 thousand innocent Syrian civilians. This news received sensational media attention with live interviews on CNN and front page coverage throughout the western world. The news relied on the judgment of legal prosecutors who “verified” the story and produced a “Caesar Report”. This was released the day before the start of Geneva negotiations. It effectively disrupted the talks and facilitated the “rebels” refusal to negotiate and walk away. In reality, the “verification” and report were commissioned by the government of Qatar which has been a major funder of the armed opposition. Since then it has been discovered that nearly half the 55 thousand photos show the opposite of what was claimed: they show dead Syrian soldiers and victims of explosions NOT tortured civilians. That is just one of the findings confirming the fraud involved in this sensational story. A concise expose of “Caesar” is here. – DemocracyNow! is a popular television/radio show. It is widely considered to be “progressive” but is also highly biased in its presentation on Syria. It almost solely promotes the perspective of those who support the armed opposition and/or western intervention in Syria. On April 5, they interviewed Dr. Rola Hallam. She is infamous for being the key player in the documentary “Saving Syria’s Children” which purports to show a chemical weapon attack in Aleppo but was actually staged. The “documentary” was then broadcast at a critical time trying to influence the 2013 vote in British parliament for an attack on Syria. On April 6, DemocracyNow! interviewed another “Syrian” who lives in the West and promotes western intervention: Lina Sergie Attar. Viewers of DemocracyNow! have no idea that the majority of Syrians support the government and especially the national Army in their struggle against invasion and terrorism. Some of the world’s most famed political analysts have contributed to the confusion and lack of resistance as the war on Syria has continued. For example, Noam Chomsky on Democracy two days ago said “The Assad regime is a moral disgrace, the Russians with them.” Evidently he believes all or most of the accusations which have been said about the ‘regime’. In sharp contrast with Chomsky’s assessment, it’s remarkable that Syria has held together as well as it has in the face of attack by some of the most powerful and richest countries on earth. Over 100,000 Syrians have given their lives defending their country against the onslaught. Russia has supported their ally in compliance with international law, continually trying to work with the U.S. coalition as a “partner” against terrorism. Evidently Chomsky is unaware or does not believe the extent of lies that have been created around Syria. Evidently he does not recognize the distorted and shameful media coverage mentioned by Kinzer. Everyone makes mistakes but Chomsky’s poor analysis here is a whopper. If he was to visit Syria and talk with real Syrians I think his perception would be dramatically changed just as described by the PBS Frontline crew here. With consummate hypocrisy, both Syrian and Russian governments are now demonized by western neoconservatives and liberals who have done little or nothing to stop their own government’s collusion with terrorists raining havoc and destruction in Syria. Unsurprisingly, more or less every image of the sarin attack victims being circulated in international media seems to have involved the infamous White Helmets or bears their logo. However many Nobel Peace Prizes they might get nominated for or however many Oscars they win, the White Helmets (funded by the US, UK and France) has already been extensively discredited and is a fake media/false-flag operation in the form of a Hollywood-ised NGO and embedded with Al-Qaeda and other jihadists in Syria (see here, or go straight to Vanessa Beeley’s work). It should be enough that the White Helmets have previously been caught with Al-Nusra (Al-Qaeda) and other extremist militias and have also been caught on numerous occasions faking videos or images to provoke Western powers into attacking the Syrian government: but the fact that CNN and various media outlets, along with various Western officials, have once again based their entire condemnation of the Assad government solely on ‘evidence’ provided by the White Helmets and foreign-backed rebels in Idlib is both highly suspect and business as usual. Moreover, she also concluded from her on-the-ground research that the White Helmets operation represents not only a fake war-propaganda operation, but a “parallel government in-waiting” designed – if all goes to plan – to replace the Assad-led, secular government of Syria. Disobedient Media also makes some important observations, noting that ‘On April 3rd, 2017, an anti-Assad journalist tweeted that the next day he would be launching a media campaign to cover airstrikes on the Hama countryside, including the use of chemical weapons’. Raising the question, of course, of how he knew there would be a chemical attack. As the same posts notes, observers had also spotted (April 1st – three days before the ‘attack’) that a doctor in Khan Sheikhoun had received several shipments of gas masks in the days prior to the sarin attack. The same figure has previously been linked to the kidnapping of two journalists and to ISIS fighters. As far as this latest sarin incident is concerned, the White Helmets footage seems to be the only source being parroted all over the world, including by President Trump and by the comically insincere Nikki Haley, who can be found waving photographs of dead children in the UN Security Council to shame everyone else into falling into line. If you thought Samantha Power was bad, Haley seems to find it impossible to even begin to fake sincerity and comes across like a really bad actress. So, what about those images and videos of the sarin victims and – to quote President Trump – “the beautiful, beautiful babies”? In fact, what should be widely circulated in regard to the recurring bogeyman of these alleged gas attacks by the Syrian regime is the analyses by the Swedish Doctors For Human Rights (SWEDHR). A group of medical experts of various descriptions have firmly exposed the White Helmets’ gas-attack videos (past and present) and images as fakes, consisting of both fake ‘life-saving’ practices and, worse, bleak malpractice on children. In a thorough, detailed report published on March 17th, Proffessor Marcello Ferrada de Noli of the SWEDHR analysed the widely circulated video footage of the ‘White Helmets’ trying to save the lives of Syrian babies allegedly hit by gas attacks from the Syrian regime. This particular analysis centers on the gas attack in Sarmine in March 2015 (please read it – it is very thorough), and demonstrates meticulously that footage being circulated by CNN, Samantha Power and other anti-Assad propagandists was demonstrably staged/faked, with jihadist-aligned ‘White Helmets’ performing fake procedures with empty syringes on children that are either already dead or have been given drug overdoses. In regard to this current sarin attack of April 5th, an equally thorough analysis by Adam Larson at The Indicter Magazine builds on the same process of analysis. The conclusion is bleak. : ‘Surprisingly specific and hard-to-deny visual clues suggest rebels are murdering the victims themselves using different methods, and lodging false claims as cover, and to shift the blame’. The real story is disturbing, to say the least, leading to an inescapable conclusion that rebel/jihadist operatives – in collusion with the Western-funded, Oscar-winning White Helmets – have not only been staging gas-attack videos and footage of victims, but may have been murdering the victims themselves via various means and then presenting them as Assad’s victims. The widely circulated footage from the scene of the attack shows White Helmets’ operatives treating the victims in ways that don’t match established protocol for chemical-related attacks (lack of protective measures, and using bare hands instead of wearing gloves, for example). The comparison picture below is courtesy of the Willy Loman blog. Just as disturbing, CNN and other mainstream media then use the rebels’ carefully-staged footage – and the heartbreaking footage of dead or dying babies – to convince international audiences (and President Trump) of the brutality of the Assad regime. Moreover, just as the former US Ambassador to the United Nations, Samantha Power, was in direct collusion with Syrian rebels in bringing their staged footage of alleged chlorine or sarin victims to the UN in order to call for action against Assad, President Trump’s Ambassador, Nikki Haley, is now – in recent days – doing the precise same thing, waving those images around in the Security Council (and probably fully aware of their dubiousness). He further pointed out the total sham of this entire UN process, however, by highlighting how the closed sessions of the Security Council simply had US and anti-Assad propagandists shaming other UN delegations into compliance via the images of dead or suffering children, but without providing any translations of the video content. Essentially, what it demonstrates is that these Western-funded propaganda videos and productions coming out of rebel-held areas could *easily* be debunked by any mainstream media organisation or government that had any genuine or neutral/unbiased interest in scrutinizing the ‘evidence’ instead of just rolling along with the propaganda line and citing ‘experts’ who ‘confirm’ that Assad carried out the chemical attack. But, as we’ve long since learnt, there is no interest in objectivity and neutrality – only a pre-fabricated agenda and a vast, staged drama: now involving an Oscar-winning, Western-funded NGO on the ground, a one-sided propaganda exercise across international media, and theatrical performances by the likes of Nikki Haley in the UN and President Donald Trump in Washington. As I noted previously concerning the White Helmets; this is “Syria, the Movie”: and it appears to have completely replaced Syria, the Reality. The United States launched 59 Tomahawk cruise missiles at the Syrian military airfield in Ash Sha’irat near Homs on April 6 in response to the alleged chemical weapons use in Idlib, an incident which Washington blames on Damascus. According to Syria’s news agency, the missile attack claimed nine lives.